Well, travelling in the EasyCabs has become that much more fun in Delhi and the National Capital Region (NCR). The company in collaboration with Airtel and Huwai, will be providing free internet access through wi-fi for the period you travel home or to your office. The Wi-fi data card E355 device made by Huwai is placed in Easy Cab's cigarette lighter slot which is powered using an adapter. The 3G services can be accessible from a laptop, iPad, or phone using a password which will be provided by the driver of the EasyCabs. 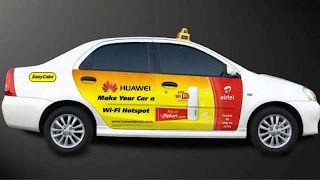 And thanks to the advertising space Airtel and Huwai get on the outer side of the EasyCabs, this service will be provided free to the clients. So next time you take a ride in EasyCabs be sure to ask the driver for the password and start surfing as much as you want through all the traffic and mess and you will find that your ride is not so bumpy after all. EasyCabs also has an service in Mumbai and in all probability the service shall soon be started in Mumbai also.